- The Rev Terrence William McGrattan, of the diocese of London, and Rector of the Major Seminary "Saint Peter" in London, assigning him as titular of Fornos Minor. The Rev Vincent Nguyen was born in Vietnam on May 8, 1966. His great-grandfather is one of the Vietnamese Martyrs. In 1981, at age 15, left Vietnam and arrived in Canada in 1984 through Japan. After secondary school studies, he obtained a Bachelor of Applied Science in Electrical Engineering (Applied Science in Electrical Engineering) University of Toronto. Joined in 1993 as "St. Augustine's Seminary in Toronto, and received a Master of Divinity. He was ordained a priest May 9, 1998 for the Archdiocese of Toronto. In 2008 he obtained a licentiate in canon law from the Pontifical University of St. Thomas Aquinas (Angelicum) in Rome as a student of the Pontifical Canadian College (2005-2008). After ordination, he held the following positions: assistant priest of the parish "St. Patrick's" in Mississauga (1998-2001), Administrator of the parish "St. Monica's" in Toronto (2001-2003), and pastor of the parish "St. . Cecilia's "and Mission" Vietnamese Martyrs "in Toronto (2003-2005). From 2008 to today was Vice Chancellor and Judicial Vicar. The Reverend Terrence William McGrattan was born in London, Ontario, September 19, 1956. Before entering the seminary, he received his degree in Industrial Engineering at the "University of Western Ontario," and practiced for a few years as an engineer. He then completed his ecclesiastical studies in St. Peter's Seminary in London, obtaining a Master of Divinity. He was ordained a priest May 2, 1987 for the Diocese of London. In 1992 he obtained a licentiate in theology in Rome at the Pontifical Gregorian University. After ordination, he held the following positions: assistant priest of the parish "St. Michael's" in Leamington (1987), assistant priest of the parish "St. Joseph's" of Chatham (1987-1990), Director of the Office for Vocations (1994-1995). Since 1992 he taught theology in St. Peter's Seminary in London and since 1997 has been rector of the same seminary. He is a member of the Council of Priests and the College of Consultants. It is part of various national and diocesan committees, including the Canadian Bioethics Society. A priest from London. This can't be good. That diocese has drifted so far out into the void. There are no vocations. Ouch! Not even the semblance of charity. "At least that ''' ''' ''' ''' ''' Tom Rosica hasn't made it, yet." Father Rosica would have been a controversial appointment. While it was rumoured that he would be one of the Auxilliary's, I expect that his histionics and his own uncharitable comments recently may have hurt his chances. Furthermore, when at the Newman Centre, he hosted the catholic heretic, Gregory Baum, and there were reports of ill treatment to those Catholics there protesting the appearance of Baum. Father Rosica is of a different era and may some day become a bishop but it won't be here; He may become a bishop someday buried away in the bureaucracy in the social communications office. My sources here and in Rome tell me he never had a chance. 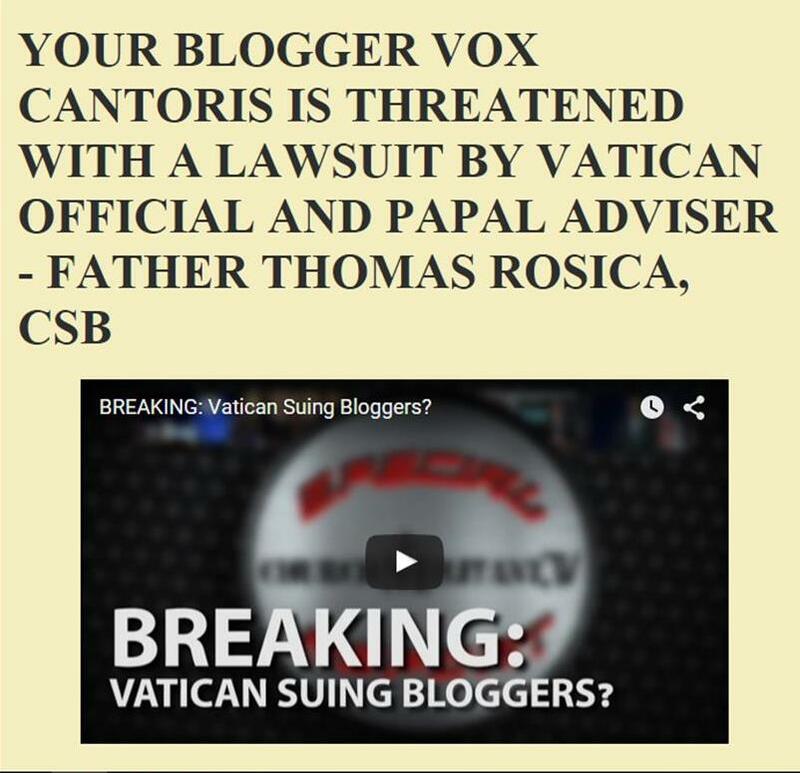 While I am no fan of Father Rosica, describing him in the manner that you did is not acceptable on this blog; therefore, your comment has been deleted and edited above. A senior priest from the diocese of London ... that was exactly my thought too. Quite right. I agree that you have every right to delete my comment. It is your right do so since it is your blog and you have a responsibility to enforce your own standards of decorum & fair comment. I hold no grudge. Nevertheless, I have no intention of apologising for my view of said cleric. Charity is a precious commodity in this wicked age & should not be wated on likes if he. I have a photo surreptitiously taken of a certain prominent priest celebrating Mass sitting down at a coffee table at a resort and I have been resisting publishing it here. Charity and prudence will strengthen us even when our more base instincts push us to to the opposite.